Lulu would love to have a pet cat of her own, but her Mummy isn’t so sure. Cats can be hard work. Mummy and Lulu go to the library to find out how to look after cats and Lulu practices at home with her toys. Eventually Mummy agrees Lulu can have a pet and they go to a cat shelter and find the perfect pet. Lulu is told about all the things she needs to do to prepare and she busily gets ready for her new pet’s arrival. She names her Makeda after an African Queen. Lulu and Makeda have lots of fun together. This is a warm-hearted story about adopting a new pet, the pleasure it can bring and the responsibilities involved. Endorsed by the National Cats Adoption Centre, this is the perfect introduction to pet owning for young cat lovers and would be cat owners. 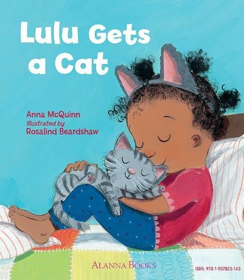 Before you start to read the story, look at the cover together, and talk about what you can you tell from the picture and title about Lulu, the cat and what might happen in the story. Read the story aloud to your child, pausing if they want to talk about what is happening or what they can see in the illustrations. Once familiar with the story children, could tell the story to you using the pictures to help them. It doesn’t matter if they use their own words to do so. Talk about the things children found interesting, or puzzling about the story. Talk about all the different things Lulu and her family did to prepare for the new pet. Count the number of toy cats in Lulu’s room and the number on the end papers. Children could act out looking after a cat with toys like Lulu does. Look for information books about pet keeping to find out more. Children can wear the cat ears like Lulu does. They might like to pretend to be a cat, thinking about how they move. Read more books by Anna McQuinn here. See here for Lulu activities on the publisher, Alanna Books’ website. Lulu reads her cat Makeda the story of Puss in Boots. Watch a cartoon version here.